When John F. Kennedy was assassinated in 1963, the country experienced a collective sense of grief that it had not known since the death of Abraham Lincoln. Many Americans found it hard to cope with the sudden loss of this youthful, energetic president whose speeches had inspired citizens to achieve high ideals. In his shortened tenure as president, Kennedy proposed landmark civil-rights legislation, created the Peace Corps, and promoted the goal of landing on the moon. In foreign policy, his administration peacefully resolved a dramatic stand-off with the Soviet Union over the presence of missiles in Cuba, and he oversaw the buildup of the American presence in Vietnam. 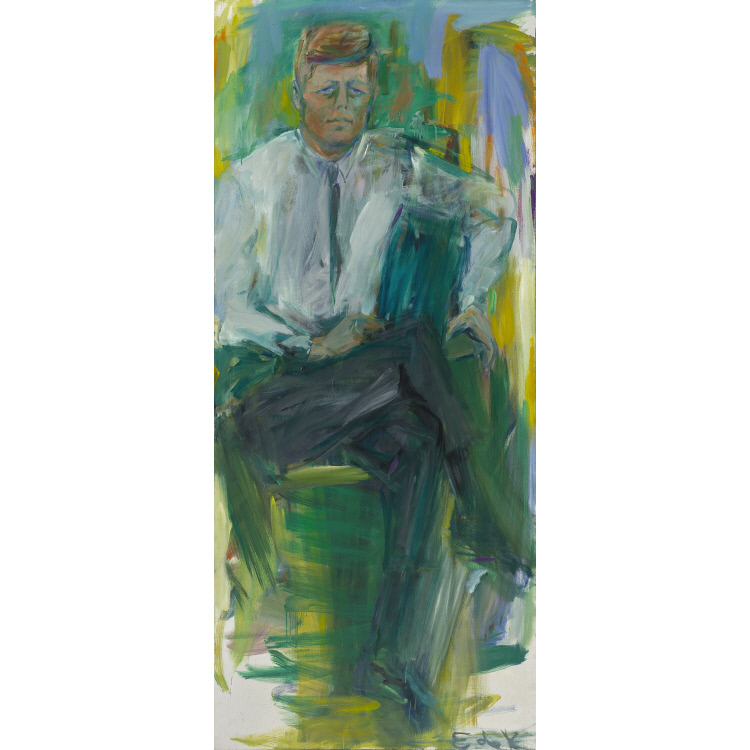 Elaine de Kooning, known for her gestural portraits, held several informal sessions with him in Palm Beach, Florida, in December 1962 and January 1963. The artist was so moved by the president during these sittings that she went on to create dozens of drawings and paintings of him over the next ten months. Con el asesinato de John F. Kennedy en 1963, el país experimentó un sentimiento de pena colectiva que no había conocido desde la muerte de Abraham Lincoln. A muchos estadounidenses se les hizo difícil sobrellevar la pérdida en este presidente joven y vigoroso, cuyos discursos habían inspirado a los ciudadanos a perseguir altos ideales. En su breve presidencia, Kennedy propuso leyes que marcarían hitos en la historia de los derechos civiles, creó el Cuerpo de Paz y promovió la meta de llegar a la luna. En cuanto a política exterior, su gobierno resolvió pacíficamente un tremendo impase con la Unión Soviética por la presencia de misiles en Cuba e increment la presencia estadounidense en Vietnam. Elaine de Kooning, conocida por sus retratos gestuales, tuvo varias sesiones informales con él en Palm Beach, Florida, en diciembre de 1962 y enero de 1963. La artista quedó tan impresionada en esos encuentros que continuó haciendo docenas de dibujos y pinturas del presidente durante los diez meses siguientes.